Designing the perfect wedding album can be a difficult task for a new bride, especially when there are so many wonderful photographs. To tell the story of your wedding day, though, you’ll need to narrow down those images. After all, someone who is flipping through your wedding album may not want to see 50 images of you and your bridesmaids getting ready. To tell the best version of your love story visually, follow these tips to designing your wedding album. The wedding photographs will typically fall within five categories. For most wedding albums, you’ll need 60-100 photographs. Obviously, you may want your album to focus more on the ceremony and the reception than on the bride getting ready. Here are some tips for breaking your photos down into categories and how many of each category you need. The Ceremony: 15-20 images. Images of a ceremony often look very similar, so 15-20 is more than adequate to tell that chapter of your love story. Wedding Party: 20-35 images. These are some of the most interesting wedding pictures, especially when you can see the personalities of the members of the wedding party shining through. The Reception: 20-35 images. The reception is where a lot of memories are made: the first dance, the bride’s dance with her father, the groom’s dance with his mother, cutting the cake and cutting a rug. Now that you’ve categorized some of your favorite images, it’s time to narrow them down yet again for the wedding albums. Get rid of pictures that are too similar to another. If you’ve chosen three shots of the groom lifting your veil, for example, narrow it down to just one. If you have trouble choosing which pictures are best, solicit the opinion of a friend. Even better, ask your photographer’s advice. When we talk about a wedding album these days, you may put one together from hard copies of your pictures, or you may upload the digital versions of your pictures to have a book printed. Either way, the preparation process is the same. Now that you’ve chosen all your images, it’s time to put them in order in the album. You’ll want the pictures to appear in chronological order in order to tell your story effectively. However, the first picture in a wedding album should always be one of the bride and groom together. It sets the tone for the rest of the album. Even though your album should, at least roughly, go in chronological order, you can vary that order slightly if two pictures work particularly well together. This usually happens when a filter has been applied to the photographs, such as a black and white, sepia or color-toned filter. 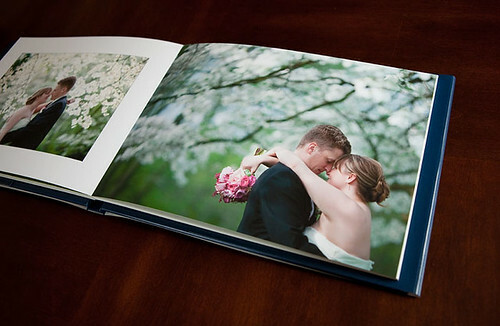 Now you have a wedding album that is elegant and thoughtfully put together. It will be treasured by you and your family for years to come. Don’t forget to give smaller albums to the parents of the bride and groom! Kimberly Smith is a wedding planner who loves helping couples create remarkable wedding albums.